Articles with keyword "Temat: Architektura i urbanistyka"
Suction lift pumps with wooden pipes were being installed in wells in Lublin already since 1826, and in 1841 engineer of the province, Feliks Bieczyński began to endeavour to replace them with lift-and-force pumps with iron pipes. Count Andrzej Zamoyski’s Machines Factory in Warsaw, that by 1863 had installed three of such devices in municipal wells, accepted the commission. Pumps were meant to be equipped with flywheels and cranks. After operation tests, the project was accepted for implementation: In the catholic city, where each of 8 wells is about 160 ft deep, suction lift pumps with flywheel and pump casing will be installed, whereas in the Jewish city, where all 4 wells are shallow - lift-and-force pumps are to be fitted. Zamoyski’s factory also offered a standard design of the pump housing. In the city files from 1809-1874 period such design is kept, submitted by the factory in 1864, when the company was assembling the well on the market square, near the Świętoduska St. and Nowa St. (part of today’s Lubartowska St.) junction. The archcathedral of St. John the Baptist and St. John the Evangelist, a former Jesuit church in Lublin. The church was consecrated in 1604. It is one of the first baroque buildings erected outside Italy. In the second half of the 18th century, after the Society of Jesus had been cassated, the church fell into disrepair. Restoration works were carried out in the first half of the 19th century. In 1823, the church was elevated to a cathedral. 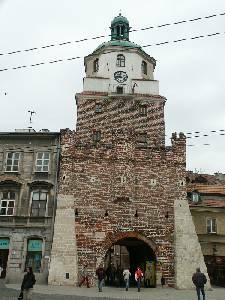 The Grodzka Gate, often called The Jewish Gate, is one of first stone-built elements of the city's fortifications built in 1342 after the permission of king Kazimierz the Great. At the end of the 18th century, the object was rebuilt. This task was commissioned to Dominik Merlini. 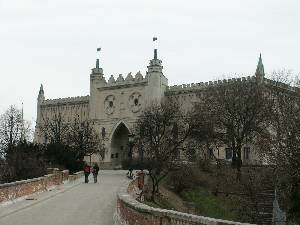 For centuries The Grodzka Gate was also called The Jewish Gate, as it was a passage between the Old Town and the Jewish district. 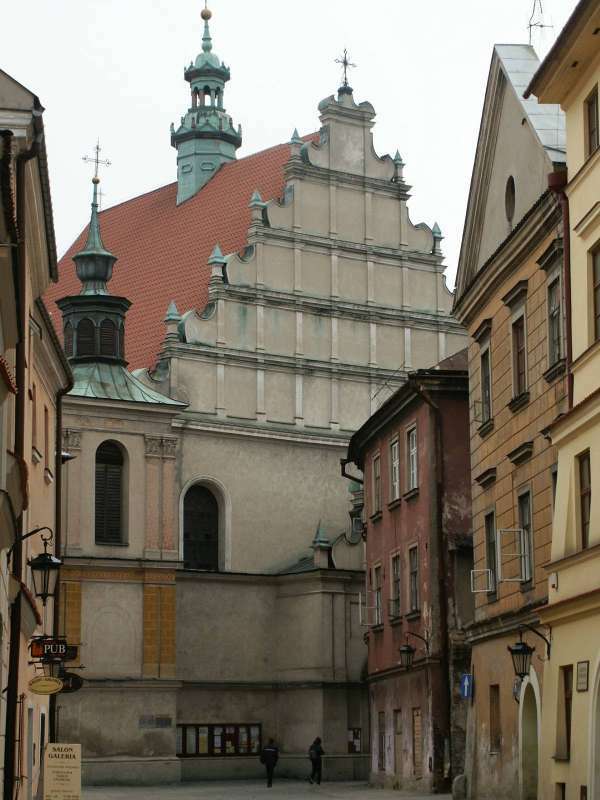 The only preserved pre-war synagogue in Lublin is the Chewra Nosim synagogue. It is located in the 19th century apartment house no. 10 on Lubartowska Street. In 1987 Symcha Wajs’ initiative led to Izba Pamięci Żydów Lubelskich (Hall of Remembrance of the Lublin Jews) being established here. 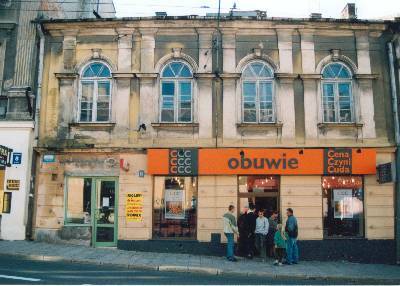 Nowadays, it is home to the Lublin branch of Towarzystwo Społeczno-Kulturalne Żydów w Polsce (TSKŻ - Social and Cultural Fellowship of Jews in Poland). The square, whose current name rose to popularity only in the 1820s, is a historic landmark, not only for Lublin, but for the entire country. Saxon Garden (Polish: Ogród Saski) in Lublin is a municipal park in Racławickie Avenue, created in 1837, in the English style, pursuant to the design by engineer Feliks Bieczyński. The name, first used in 1860, was a reference to Saxon Garden in Warsaw. In 1829, due to the lack of free space in the Jewish cemetery in Sienna Street, Nahum Morgenstern, acting in the name of the Jewish community, bought a parcel north of the city limits, called the Grabowiczyzna, with intention to establish a cemetery there. The first burial in that cemetery took place in 1830. Since then, the Jewish cemetery situated in that area has been called the new Jewish cemetery in Lublin. 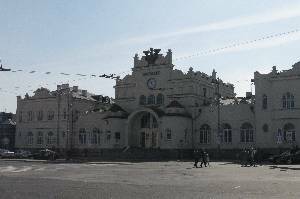 The official decision to build a railway station was made in March 1875. First test trains departed already in mid-August 1887. History of the property at 56, Krakowskie Przedmieście St. 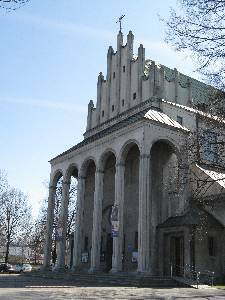 The parish church of St. Michael the Archangel was built in Bronowice, a district of Lublin, in the years 1930-1938, to the project of well-known Warsaw architect Oskar Sosnowski. The parish church of St. Theresa was built in the district of Lublin called za cukrownią (‘past the sugar plant’) in the years 1936-1937. Constructed to the design of Lublin-based architect Jerzy Siennicki, it is the only half-timbered church in the Lublin region.